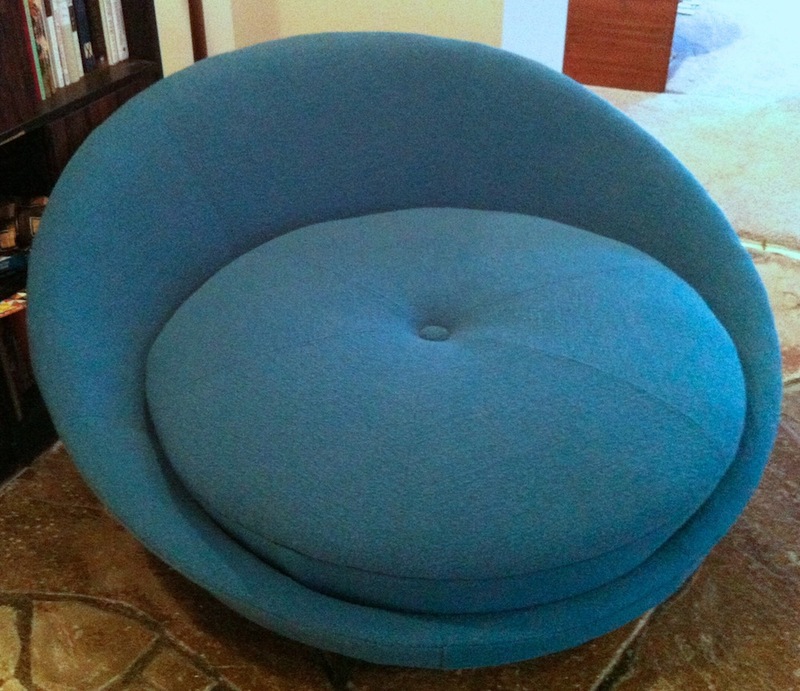 You see this 5′ diameter lounge chair attributed to Milo Baughman but I think that’s just one of those internet rumors that gets started and then is perpetuated because it’s just there. Anyway, it had the original frieze fabric from the 1961, with a lot of wear. A lot. 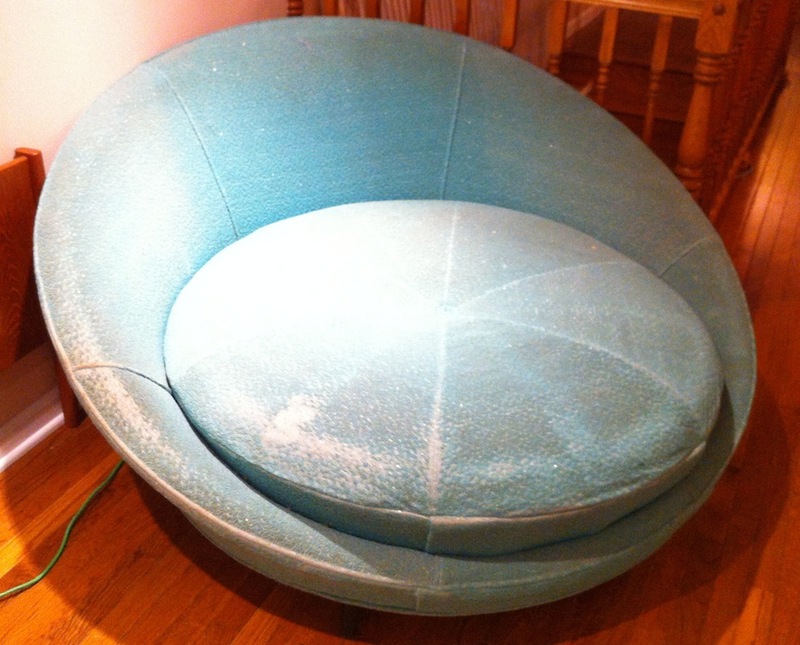 The owner chose Knoll “Classic Boucle” fabric in Aegean, a beautiful deep turquoise. In addition to being worn, it was very faded. The original color was a pretty jade green. The seat on this chair is a separate piece from the outer frame. It has these sinuous springs that are attached to a center disc of wood. 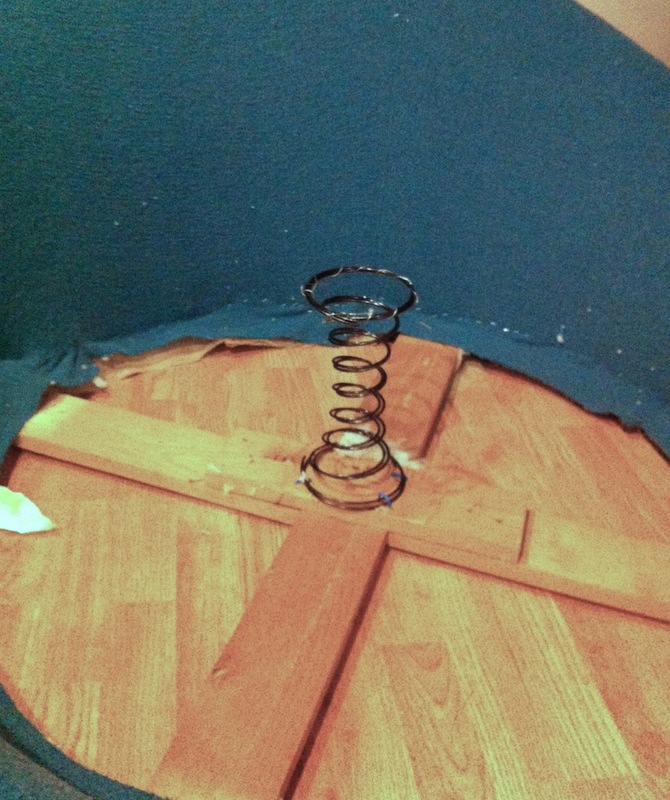 The springs had a very disconcerting way of kind of collapsing when sat upon, which just wouldn’t do. 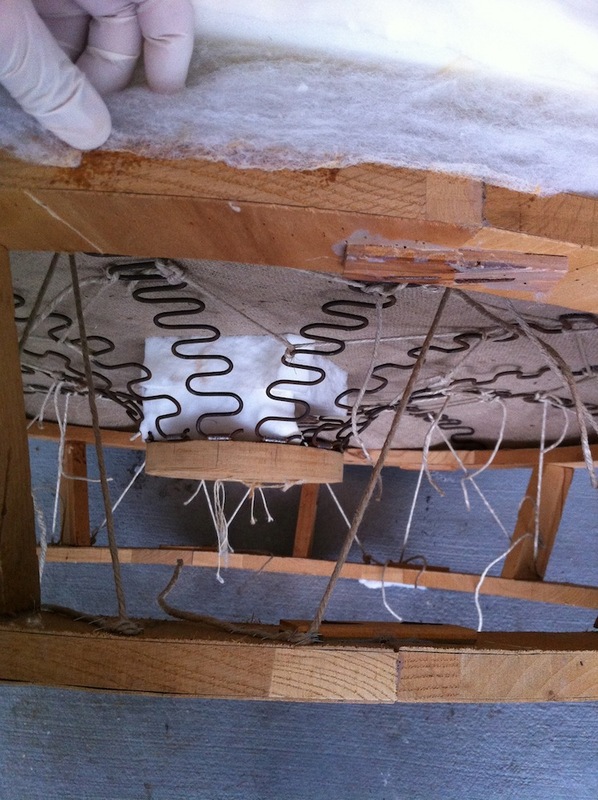 I started by sticking a blog of firm foam between the upholstery and the disc. This is the outer frame. The center of that X framing on the bottom was just under the disc of wood—with no support in between whatsoever! So I stapled two coil springs to the base and now it’s got great support and is very comfortable. 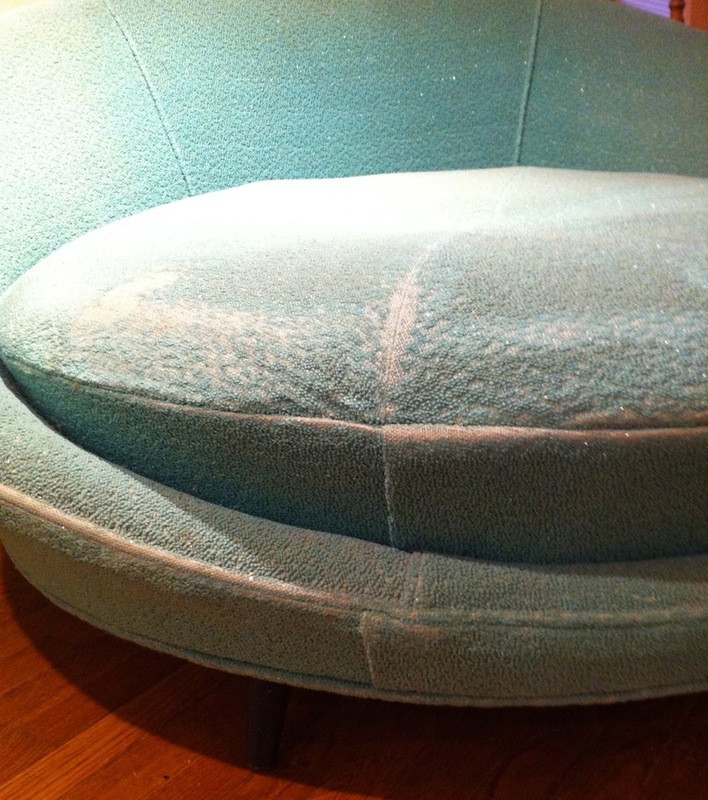 I think it’s fine to stay as original as possible when restoring furniture, but if something is wildly uncomfortable and can be made more comfortable—and thus more functional—without changing the outward appearance, then I say GO for it. Life is too short to spend any of it sitting on furniture that feels bad. This entry was posted in mid-century modern and tagged mid-century modern lounge chair, Milo Baughman, round lounge chair. Bookmark the permalink. 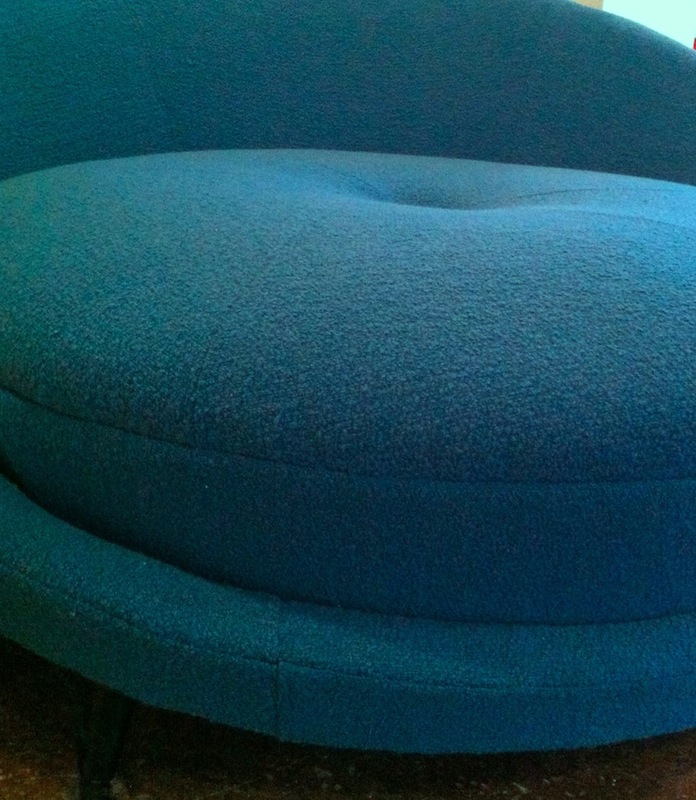 I used to own an identical chair to this in navy mohair. I loved it until the spring broke like you mentioned. I foolishly sold it for $100 and saw it in a window of an antiques store in Los Angeles for $1000 a few days later. That was in 1989. Its nice to see one of these again. I have a chance to buy one of these. How many yards of fabric did it take to revover it? Did they say how much they bought the chair for? I think I used about 6 yards with very careful placement and no errors. I don’t know what the chair sold for, sorry. I’m shocked at only 6 yards! I think I’m picking mine up tomorrow! You said you attached 2 coil springs to the base frame under the seat but the picture only shows one. The chair looks beautiful. It does look like one but it’s actually two coiled together. One didn’t have quite the resistance I was looking for but two together were just right.